The latest feature from writer/director Bobcat Goldthwait is a joyously scathing satire of our celebrity-worshipping culture and the widely-accepted cruelty that accompanies it. Frank (Joel Murray, brother of Bill) is a shlubby, middle-aged salaryman who gets fed up, Network-style, with his unreasonably loud neighbors, mindlessly chatty co-workers, and the general inanity of modern popular culture. After getting laid off from his job, Frank is inspired by an episode of My Super Sweet 16 to strike out against the rudeness that permeates our society via a merciless killing spree that will easily divide moviegoing audiences. An ADD-stricken motormouth of a high schooler named Roxy accompanies him on his cross-country journey in which, like a modern day Bonnie and Clyde, the pair lay waste to everyone from God-fearing homophobes to people who talk during movies. The whole affair is gleefully violent with a little something to offend just about everyone, which is exactly what Goldthwait intends though he does flex his filmmaking chops by adding some legitimately affecting scenes of heartbreak. 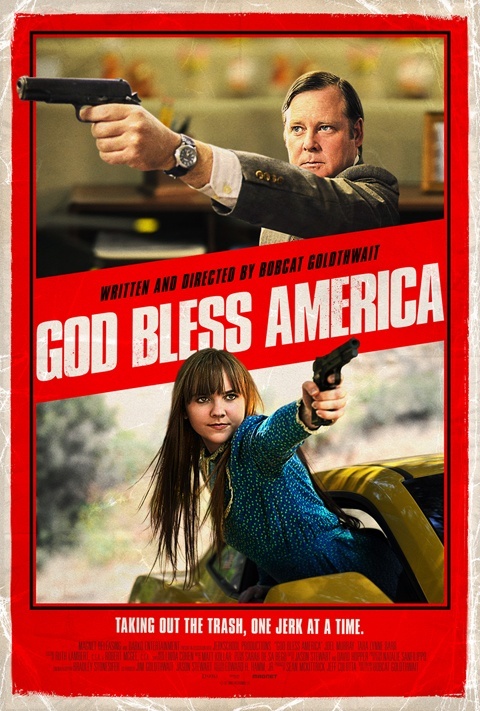 While some may feel that the film gets a bit preachy at times, and who can really say if it will have a positive (if any) impact on the way things are (fingers crossed), it’s hard to deny that God Bless America is an anarchic joy for the frustrated like-minded. God Bless America opens today at the Ritz at the Bourse.